Research shows that spinal manipulation and adjustments like the ones provided by Dr. Anton Pyatetsky DC – one of the primary treatments provided by doctors of chiropractic – may be an effective treatment option for tension headaches and headaches that originate in the neck. A 2014 report in the Journal of Manipulative and Physiological Therapeutics (JMPT) found that interventions commonly used in chiropractic care improved outcomes for the treatment of acute and chronic neck pain and increased benefit was shown in several instances where a multimodal approach to neck pain had been used. Also, a 2011 JMPT study found that chiropractic care, including spinal manipulation, improves migraine and cervicogenic headaches. 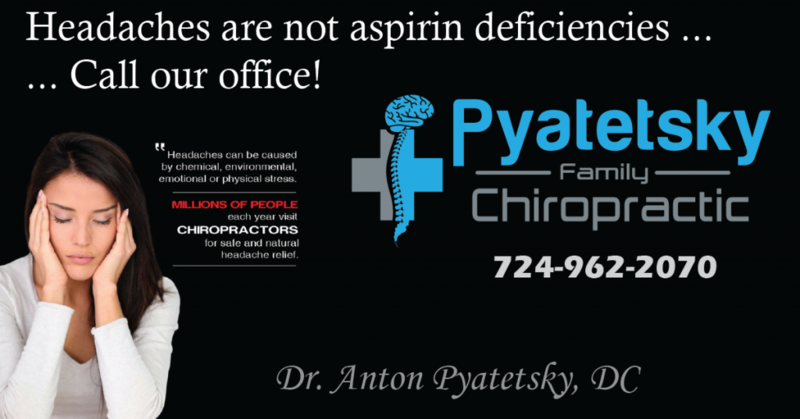 Call Pyatetsky Family Chiropractic if you are suffering from any of the following types of headaches. Headaches can range from annoying to debilitating and their cause can be benign or life threatening. The majority of headaches are benign and are caused by dehydration, muscle spasms, stress or vertebral misalignment. It is important to know what type of headache you are suffering from prior to prescribing a type of treatment. If you are suffering from a dehydration headache, all the aspirin in the world won’t decrease your pain. Headaches can also be caused by serious conditions such as tumors; therefore you need to speak with a health care practitioner if your headaches last longer than a week. The following is a brief description of the most common types of headache classifications. Description: Tension type headaches are the most common, affecting upwards of 75% of all headache sufferers. As many as 90% of adults have had tension–type headaches. Description: Migraine headaches are less common in tension–type headaches. Nevertheless, migraines afflict 25 to 30 million people in the United States. As many as 6% of all men, and up to 18% of all women experience a migraine headache at some time in their life. Nausea, with or without vomiting, and/or sensitivity to light and sound often accompany migraines. An “aura” may occur before head pain begins–– involving a disturbance in vision, and/or an experience of brightly colored or blinking lights in a pattern that moves across the field of vision. About one in five migraine sufferers experiences an aura. Usually, migraine attacks are occasional, or sometimes as often as once or twice a week, but rarely occur daily. Treatment: In the treatment of migraine headaches is important to determine the triggers that cause these headaches. For some people food is a trigger. The most common known food triggers are the four C’s; cheese, chocolate, caffeine and citric acid. Citric acid is a preservative that is found in a number of different foods and has been shown to be a trigger for migraine headaches. It is important to remember that everyone’s triggers may differ and it is important to determine what your own individual triggers. Using a food journal can be an effective way of tracking headache symptoms and relating them to food triggers. Stress has also been shown to be a trigger for these headaches. Meditation has been shown to be beneficial in decreasing the stress that can trigger these headaches. For more information on meditation, see the treatment section under tension headaches. Treatment: The treatment of a food allergy headache involves removing the particular offending food. This can be very difficult in a society where we tend to eat meals that contain many different kinds and types of food. The gold standard for treatment of food allergies is the food elimination diet. This diet involves removing all foods from your diet except for a small number of foods that have been shown to be hypoallergenic. Once your body has eliminated the allergens, which typically takes two-weeks, certain individual foods are reintroduced and symptoms are noted. Food allergies can also be tracked using a food diary. Unfortunately some foods may cause an immediate reaction while others may take hours or days to produce a reaction. This complicates the tracking of symptoms associated with different foods. There are also different blood tests available that measure how your body reacts to certain foods. These tests are provided by naturopaths and some chiropractors. Cluster headaches come in groups or clusters lasting weeks or month. The pain is extremely severe but the attack is brief, lasting no more than an hour or two. The pain centers around one eye, and this eye may be inflamed and watery. There may also be nasal congestion on the affected side of the face.